Got mine yesterday. Looks great on the golf buggy. Very good idea. You might want to give the local hotels some if they will hand out to their guest. I got mine here today in Chicago and can't wait to buy a golf cart so I can display it! December cannot come soon enough!! Thanks for a great idea! UPDATE - Thanks for the support with the Static Clings. We ordered more and have plenty to accommodate everyone! 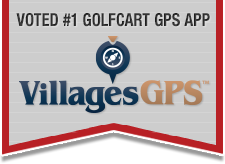 If you haven't ordered yours today email us at talkofthevillages@gmail.com and tell us how many you need for your golf carts or vehicles. We have had many requests for quantities from 6 up to 20 at a time to hand out to friends, etc and want everyone to know that we have no problem giving these to you and appreciate you getting them to your fellow Villagers... Again thanks for your support. On 2/21/15 we went to Giovanni's to get a gluten free pizza and asked about the Static Clings for TOTV and the #1 boss (Giovanni), said he did not have any.